The US Army Maintenance Plant at Ober Ramstadt (a.k.a. the Ober Ramstadt Tire Rebuild Plant) celebrates its 30th anniversary this year. The major mission of the plant is to rebuild tires of all types in support of USAREUR units, authorized USAFE units and Foreign Military Sales customers on a space available basis. In addition, the plant's Special Products Division makes rubber-based items specifically orderded by units. The plant is also responsible for training USAREUR and authorized USAFE units in tire inspection and classification. Production volumes projected for FY 1976 are 88,000 pneumatic tires; 33,000 solid tires (used by tracked vehicles) and 99,000 track shoes (rubber coverings used on tank treads). In FY 1975, the plant saved the US Government over $3.5 million through its tire rebuild mission. The plant was formed in 1945 when the 425th and 430th Tire Repair Companies were merged and it became known as the Tire Depot, Ober Ramstadt. (The plant recapped its first tires in May 1946.) Since then the plant has been under nine different commands - today, it is controlled by USAMMAE. The production processes at the plant are currently in the middle of a modernization program (the program was initiated in 1971). The pneumatic tire process renovation has been completed; the renovation of the solid tire and track shoe processes is expected to be completed later this year. In addition, the plant is also upgrading its equipment. The plant, under the command of Maj Larry R. Taylor, has a staff of 5 military personnel, three American civilians, and 215 civilian employees of various other nationalities. 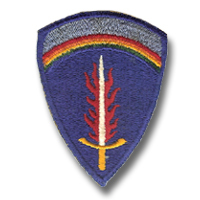 I was assigned to the Hqs 60th Ordinance Group from 1946 - 1948 in Ober-Ramstadt, Germany. My CO was Capt Clyde O McGaffick. I don't recall what happened to the organization, but in 1948 several of us were transferred to the 7841st Tire Rebuild Depot there in Ober-Ramstadt where I stayed until I came back to the States in Dec 1949. I have a dear friend of mine that is living in Grants Pass, Oregon that was also stationed there in the 60th. I have some old black and white photos that were taken there. If I recall the building our offices were in was also known as the Georg-Schrobel Mfg. In August 1954, the U.S. Army's Ober-Ramstadt Ordnance Tire Rebuild Depot passed the 3,000,000 mark in the production of molded-rubber articles. The depot, which began operations in 1946, has manufactured a mountain of molded-rubber articles, ranging from weather stripping to seat cushions, and has renovated 858,077 tires and 504,549 inner tubes over the eight-year period. Commanded by Maj George H. Baxter, the sprawling depot is responsible for the rebuilding and repair of all solid and pneumatic tires and tubes and the manufacture of molded and pressed articles for tanks and other wheeled vehicles throughout USAREUR. By the use of the molded-rubber process, any type of rubber article can be produced by the depot. At present, 615 different articles are made by this method. Last year, 17,696 wheels and 5,630 shoe pads were turned out for tanks in USAREUR. The quality and availability of the finished products net the US. Army an average monthly savings of $429,817. 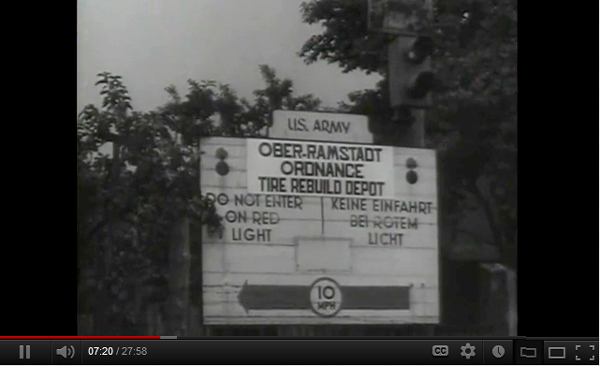 The operation of the U.S. Army Depot Activity at Ober-Ramstadt was turned over to a civilian contractor on April 1, 1980. 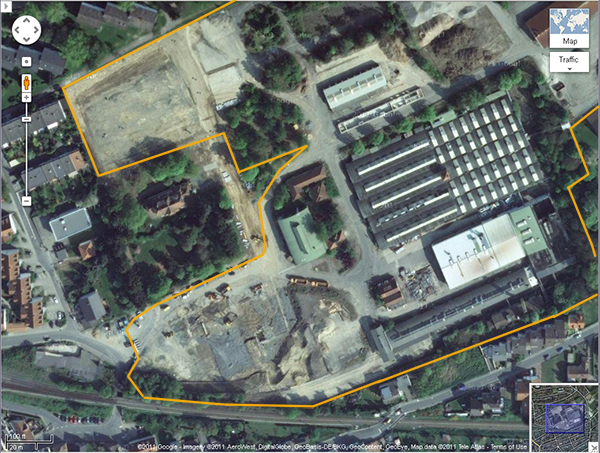 The new contractor, Mainz Industries Panzerwerk, has managed the Mainz U.S. Army Depot since 1956. The plant, east of Darmstadt, is the only one of its kind in USAREUR and retreads tires from Army units, Air Force ground vehicles and NATO forces from throughout Europe. The plant also overhauls and replaces the rubber pads on tank tracks and tank road vehicles. The 260 local national employes at the depot activity are all keeping their jobs under the new contractor, a military spokesman said. The plant is the second largest employer in the city. If you have more information on the history or organization of the Ober-Ramstadt Tire Rebuild Depot, please contact me .